Located on the wall behind the memorial sculpture to the old IRA on Abbey Street one can see two crests on the upper courses of the wall behind and to the left. One is of the Cuff Family and the other a combination of the Cuff and Knox Families. It is unlikely that this was the original position of these two stones. The coat of arms on the left of a pair has a Latin motto on the ribbon below the crest. 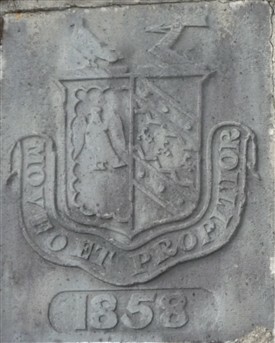 This better maintained crest, is dated 1858, and the translated from “ MOVEO ET PROPITIOR ” to “I MOVE AND AM APPEASED; is a Knox motto. The main body is that of a shield divided in two halves and capped with a bird on the left, and on the right an arm brandishing an arrow. The bird may represent “Love and Peace" or "Courage and perseverance hero; able man in politics” and the arm “a person with qualities of leadership”. The arrow held by the arm represents “Readiness” (for battle). This crest is a combination of the two landlord families of Ballinrobe; the Cuffs and the Knoxes, and was possibly created to celebrate the union of the two families. 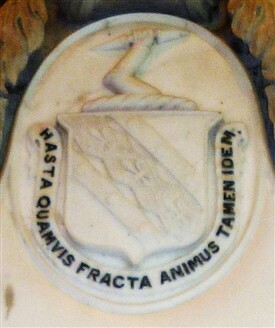 A similar depiction of the right side of this crest can be seen in the local Library, on a Cuff memorial plaque - see photo. 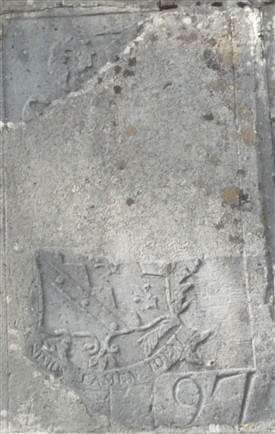 The second crest dated 1797, which is difficult to decipher as it is so badly damaged, is the Cuff Family crest with the Latin inscription “ Animus tamen idem”, and when translated is “Yet our mind is unchanged.” One can see traces of the three diagonal Fleur de Lis similar again to the Cuff Crest, in the Church of Ireland. I was recently told by Mr. Rory O’Neill that when Mr. Maurice Galvin was building his house beside this site, he removed a very sound structure in his garden, which he had been told was a school. This would explain the current location of the crests as they may have adorned the school. 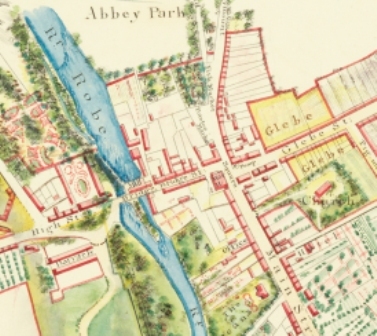 There were nine daily schools in Ballinrobe at one stage, six of which were in the town, two at Lakeview and one at Rahard. One of the daily schools in the town was aided with a £20 grant from the National Board, £10 from C.N. Knox Esq., and a free house and garden; and another from C. N. Knox for £10 and another free house and garden. While Mr. Knox supported two schools, their location is not confirmed at the moment.